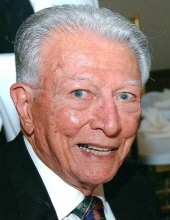 James Billy Silman was born to John Jared and Nancy Elizabeth (Pratt) Silman on March 6, 1923 in Commerce, Texas and passed at the age of 96 on March 17, 2019 in Norman, OK. Our Dad and your Dr. Silman will be missed. He left Betty Anne, his beloved wife of 73 years, knowing that one day they will be joined together again. Dr. Silman is also survived by their three children and their spouses: John and wife Beverly Silman, Nancy and husband Bob Dill, and Allen and wife Karen Silman. He leaves behind two granddaughters as well: Kristi and husband Nick Giallourakis and Tiffany Silman. He was preceded in death by his parents and two brothers. Bill received a degree in Chemistry from Texas Christian University before moving to Norman, where he earned a degree in Zoology from the University of Oklahoma in 1947. Bill was a Corpsman in the US Navy, and while he was stationed at South Base in Norman, he met Betty Anne Spencer by cutting in on her dance partner and (literally) sweeping her off her feet. The two were married August 31, 1946 in Norman, one day after Betty graduated from the University of Oklahoma. Betty and Bill moved to Houston, TX where Bill attended Baylor Medical School, graduating in 1951. Bill joined the US Army as a medical officer (1st Lieutenant) and was sent to San Francisco for his internship before being stationed at Ft. Hood. Upon his discharge from the Army he set up a private practice in Waxahachie, Texas. After eight years of building his practice in Texas, Betty convinced Bill to move the family back to Norman. During his 50+ years of medical practice in the Norman community Dr. Silman was very busy. He started by opening a private practice, and in 1961 the Cleveland County Health Department asked him to also act as their Medical Director for “just a few weeks”. Those few weeks turned into 50 years of working on and off for the health department, in addition to his other positions. Dr. Silman joined the staff of Norman Regional Hospital in 1962, and over the next five decades he worked in several capacities, including one term as the Medical Director of Health Promotion and Education and heavy involvement with the Norman Regional Healthy Youth program, work which earned him a Lifetime Achievement Award from Norman Regional Health System. During this time Dr. Silman was also the Medical Director of the Absentee Shawnee Tribe of Oklahoma and as an adjunct professor at the University of Oklahoma. Dr. Silman was extremely dedicated to his work into his 90s, and finally retired in July of 2015 at the age of 92. Dr. Silman’s list of accomplishments and awards are too many to name. He served on several state committees, including one on smoking cessation, and was also active in the American Heart and Lung Associations. He brought aerobic exercise to the community and volunteered for many organizations, including the Red Cross and the YMCA. Dr. Silman had a kind and giving spirit, and together with his wife endowed a scholarship through the Norman Regional Health Foundation in 2018 which is awarded annually to a deserving Norman Regional employee. Dr. Silman’s passions were many and varied. He was a voracious reader and never went anywhere without his camera. He was known for the handmade cards he would send to people with one of the pictures he had taken pasted to the front and a handwritten message inside. He was an inveterate traveler, visiting destinations all over the world, everywhere from Israel to China to Alaska, always with Betty by his side. He was very physically active and loved to watch sports, especially when played by his Oklahoma Sooners. He had a passion for music and a love of animals. Dr. Silman lived to serve. He was a true people person and a brilliant physician, but it was his character that made him a fantastic person. He carried a prescription pad around with him, and whenever he encountered someone new, be it a waitress, a store clerk, or any other person, he would take out his pad and write them his “prescription for living”, complete with his signature, just like a real prescription. He loved and embraced people, and he modeled strength and was a rock in the face of adversity. He never wavered and was always optimistic. Dr. Silman was kind and gentle in the most difficult situations, always compassionate, always understanding. Dr. Silman was wonderful and special… leaving us all with millions of miles of memories. Dr. Silman’s family and friends will be present at Tribute Memorial Care from 6:00-8:00 pm on Wednesday, March 27th. Services to celebrate Dr. Silman’s life will be held at 2:00 pm on Thursday, March 28th at First Presbyterian Church, Norman (555 S. University Blvd). To plant a tree in memory of Dr. James B. Silman, please visit our Tribute Store. Dr. Silman's family will be present to receive friends. Please make checks payable to Norman Regional Health Foundation and put Silman Scholarship Fund in the memo line. "Email Address" would like to share the life celebration of Dr. James B. Silman. Click on the "link" to go to share a favorite memory or leave a condolence message for the family.